Using Mattify's Powder products, she shows you the correct way to layer products, so you end up with a natural look that glows, instead of looking greasy. 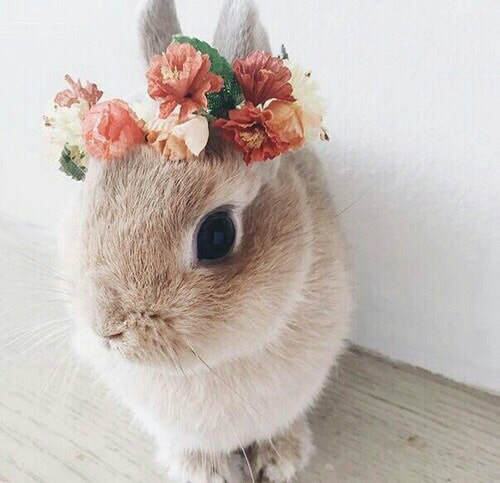 Mattify has compiled a list of makeup, skincare & beauty companies who are cruelty-free! Please don't hesitate to share this list with all of your animal-loving friends. Many of the companies on the list also specialize in vegan products. Exciting news! In September 2018, California passed a bill banning the sale of products that have been tested on animals. This bill, set to be enforced in January 2020, is the first of its kind in the USA - and we hope more states follow suit. It's a far cry from cosmetic & skincare product laws in China, which dictate that a company MUST conduct animal testing to lawfully sell their items. Although we did extensive research, we are sure many cruelty-free companies are out there that don't appear on this list. If you know of any, please let us know and we will gladly confirm & add! Click here to view the full list of cruelty-free makeup & skincare companies. Some of our customers & reviewers have come forward to let us know the real game-changer when using makeup setting spray: Applying it both before and after foundation! Yes, that’s right – not only should setting spray be used after foundation, but when used beforehand, it creates a dry base that locks foundation in place, while preventing liquid foundation from seeping into pores. Here at Mattify, we’ve done some testing of this theory – and the results are tremendous. Not only does it stop skin from getting shiny, it prevents the dreaded “foundation transfer” onto clothing or hands. It works with both liquid makeup and powder foundation, and combines beautifully with Mattify’s transparent powder, to provide a natural matte look that stays oil-free for hours. Step 1: Cleanse face as usual and towel dry. Step 2: Apply your favorite acne treatments and moisturizer. Allow to absorb for 5 minutes. 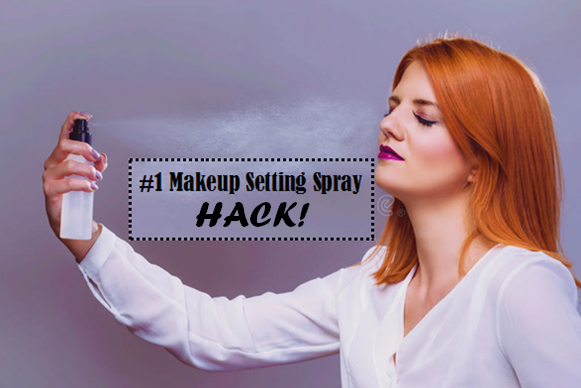 Step 3: Spray a fine mist of your chosen Setting Spray onto entire face, with eyes closed. Allow to dry for a few minutes. ​You now have a matte look that will last all day and into the night! It also doesn’t budge during hot humid weather, and is a great way to waterproof your makeup. *Most makeup setting sprays do contain alcohol – so if your skin is hyper-sensitive to alcohol, this may not work for you. As long as a light weight moisturizer is used beforehand, the alcohol will not be overly drying to your skin. **Avoid Setting Sprays that contain shimmery ingredients or Glycerin, as those will make skin appear even oilier. If you have acne prone skin, avoid sprays that contain dimethicone (silicone), as it tends to clog enlarged pores, creating a breeding ground for acne bacteria. Also beware of anything titled “hydrating mist”, “refresher mist”, or “rosewater spray”, as these are not designed to lock makeup into place. They are intended for dry skin types and provide a dewy finish – the last thing most people with oily skin would want! Urban Decay All Nighter – Felt light weight, non-sticky, non-drying. Did well with setting makeup, but didn’t seem to control much oil. Ben Nye Final Seal – Genuinely waterproofed our makeup, very long lasting & stopped oiliness. Careful not to apply too much (2-3 sprays is perfect), or it can feel a bit constrictive. NYX Makeup Setting Spray - Felt flexible and light, but didn’t control oil at all, so makeup still transferred a bit. Would probably be best for dry to combination skin types. MAC Prep & Prime Fix - This one actually made skin feel even oilier, and didn’t set makeup at all. Face felt sticky, and almost like the product never really dried. Definitely would not recommend for oily skin types, only for dry skin. Model in a Bottle – This is one of the original setting sprays to hit the market, and is still one of the best. It felt light and flexible, prevented any transfer, and was up to the task of preventing skin from getting oilier. The question: How do I get a flawless look if I have large pores, oily skin and acne? The Answer (and another question! ): Have you ever taken pictures under perfectly soft lighting where everybody looks like ethereal beings, with nary a flaw in sight? Well THIS is what blurring powder can do for you! Regardless which type of foundation you use, or what your skin type, blurring powder provides an airbrushed finish that looks impossibly flawless. Blur powder is designed to float over pores, fine lines and scars – offering an even finish that diffuses light. Regardless of the type of lighting you’re under (from horrible fluorescents to beaming strobes), skin will have a soft-focus look when you use blurring powder. When applied alone, blur powder allows your natural skin tone to show through, while distracting from flaws. When used over foundation, pores practically disappear, and skin has a uniform natural looking finish. Most blur powders are very light weight and transparent – so they provide a natural look without adding excessive amounts of color or texture. Now let's take a look at the different types of blur powder. ​Matte powder is your best bet. Products that contain shiny ingredients like Mica and Pearl Powder have a tendency to accentuate flaws such as large pores, breakouts, and acne scars. In addition, these ingredients can become lodged inside of pores – enlarging them even more, while also causing blackheads and breakouts. Especially when oily skin is a problem, it’s best to opt for a matte formula; then add highlighter to carefully selected areas of the face, if you want a natural looking glow. ​Oily skin types should use Mattify Cosmetics ULTRA Powder, as this product not only blurs pores, but also absorbs more oil than any face powder on the market. Intended to be used both before and after foundation, the feather light formula protects pores from getting clogged by liquid makeup, plus provides an airbrushed finish when used as setting powder. And did we say oil absorbent? Oily skin has never seen a product that controls oil like Mattify ULTRA Powder. It prevents shine for hours, and stops foundation from feeling sticky when oil starts to emerge. As an added benefit, this powder is 100% natural and Vegan, and does not contain other common skin irritants such as Bismuth, Dimethicone, or Talc. 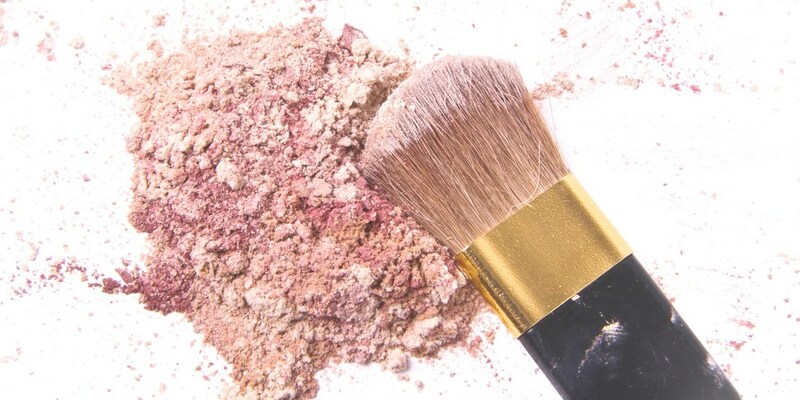 Dry skin types can look washed out and dull if the right powder products aren't used. What's more, completely matte powders can cling to dry spots, making them stand out even more. In contrast to oily skin types, dry skin does well with products that contain a bit of sheen, as it adds an overall brightness. 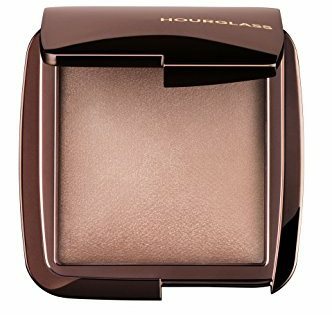 If you’re in search of face powder that does not absorb oil (because your skin produces minimal amounts), try Hourglass Ambient Lighting Powder. This blend contains Mica, and will add subtle hints of shimmer. Dry skin types often have small pores and are less prone to acne, so these ingredients are generally safe to use without fear of breakouts. Women with this skin type are lucky and can get away with using any type of blurring powder – but you may want to avoid excessively shiny powder if you have an oily T-Zone. Try No Sebum Blur Powder, which will take care of random oiliness, without over-drying other areas. This product does contain Dimethicone, which can settle into pores and trigger breakout for some - so beware of using it if you have large pores. When using any type of product that contains Dimethicone (liquid primer, foundation etc.) you should always exfoliate during cleansing. Try Mattify Cosmetic's The Exfoliator, which contains Apricot and Bamboo to flush out pores, and Green Tea, which firms the skin. Another good selection for combo skin is Bye Bye Pores, by It Cosmetics. This one provides a beautifully airbrushed look over foundation, and feels very light. Silk Powder (one of the main ingredients) is designed to hold and release moisture when needed, making it perfect for combination skin types – who will love the satiny feel and look of this product. Its barely-there sheen helps skin look slightly luminous, without looking overly shiny. This one isn’t suitable for Vegans though, as the product does contain Collagen. Of these two brands, neither offer massive oil control - so if your combination skin has an annoyingly oily T-Zone, you might want to use Mattify ULTRA Powder for Oily Skin on select areas first, and then finish with Bye Bye Pores or No Sebum Blur Powder. ​Blur powders should be every girl's best friend - because they're like an Instagram photo filter you can wear in real life. They get to work filtering out harsh light, while providing an amazingly even skin tone. 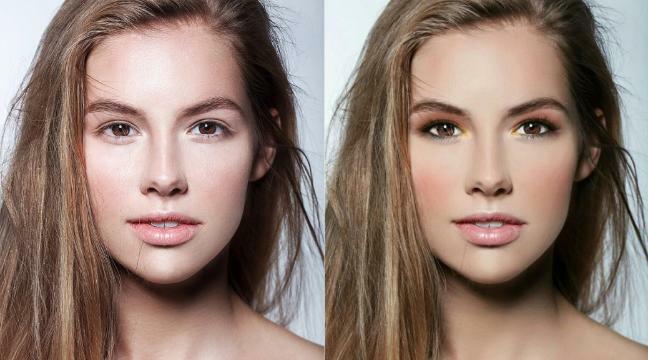 ​Three cheers to blurring powder!! 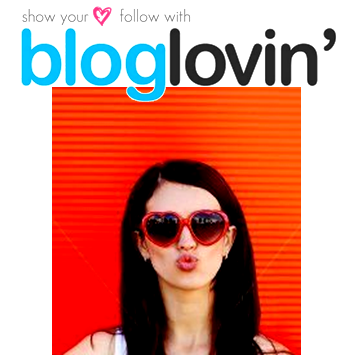 You could seriously spend all day browsing through Bloglovin' ~ it contains bundles of amazing content, sort of like Pinterest for bloggers! We're excited to be connected with the biggest blog announcement website online, where you can follow your favorite sites and keep track of them all on your very own Bloglovin' home page. Click here to visit Mattify Cosmetics on Bloglovin'. ​Q: Why does oily skin become dehydrated & dry during seasonal changes? Change of seasons can wreak havoc on the skin. How many times have you had an influx in breakouts during the shift from summer to fall, or from winter to spring? It’s a fairly common occurrence, but can be prevented by switching up a few steps in your skincare routine. A: Cold winter weather leaches humidity from the atmosphere, which is why skin tends to feel dry and tight while you’re outdoors. To create a comfortable temperature, most indoor buildings have central heating, which also removes moisture from the air. You may notice that no matter where you spend most of your time during winter, your skin always feels dry – even if it’s prone to being oily. #1 Rule: Be sure to moisturize! ​Nothing sends skin into a frenzy worse than disruption in moisture levels. As skin recognizes its need for hydration, it begins pumping out even more oil than usual. This translates to clogged pores, breakouts, and skin that feels dry & tight, but looks extra shiny. The majority of moisturizers on the market have a tendency to be overly emollient and thick. They rarely absorb fully into skin, leaving behind a sticky film that attracts environmental pollutants and prevents skin from feeling clean. What’s worse, they combine with foundation, forming a sticky mass that gets lodged inside of pores. Hello breakouts! Those with oily skin should always look for gel or serum moisturizers, which hydrate without contributing to excess oil production. Mattify’s Incredi-Gel and Stop-Zit light weight moisturizers for oily skin and acne prone skin have been formulated especially for those who have had bad experiences with traditional moisturizing products. Their aloe gel base is saturated with essential oils and absorbs within seconds, sending the medicinal properties of these plant oils deep into pores, destroying acne bacteria and balancing oil production – without adding any shine to skin, or disrupting makeup application. In 2018, Mattify! Cosmetics will be introducing their NEW Mask Bar, with natural ingredients designed to pamper acne prone, oily skin! If you’re using chemical based acne treatments, spot-treat each breakout individually, rather than applying the product to your entire face. Most chemical acne products contain ingredients intended to dry out the breakout - so when they’re applied to your whole face, they can severely dehydrate skin, which leads to excess peeling and oil production. Instead, use a face scrub that helps prevent acne in the first place. During your morning and/or evening routine, apply Mattify’s The Exfoliator in slow circular motions, to remove dead skin cells that can trap debris inside of pores. Once the scrub has been rinsed away, use a face wash that contains Mattify’s Essential Oil Treatment for Acne Prone, Oily Skin. The plant-based ingredients in this additive help to balance oil production, rather than stripping skin of moisture, as some harsh soaps can do when used alone. The formula also deters acne bacteria, so you end up with fewer breakouts in the first place. ​Following these simple steps can make all the difference between irritated breakout-prone winter skin, and fresh glowing skin! ​​People tend to think of a direct, immediate impact between bad eating habits and bad skin – for example, many believe that eating greasy food will literally cause oily skin. ​The reality is a bit more complicated. Here’s what actually happens: ​Unhealthy food choices such as greasy fast food, sugar, soda, white bread etc., cause the blood to become highly acidic over time, which peaks the inflammation response. In a struggle to obtain a harmonious balance, body systems go haywire and hormonal changes can even occur. Excess hormones, combined with body-wide inflammation can trigger breakouts and excess sebum production. If a breakout is just beginning, the inflamed area expands, as the body’s fight response goes into over drive. Acne bacteria also feed off an acidic environment – turning that tiny breakout into a much larger pustule, that can take weeks to heal. Wouldn’t it be nice if fast food restaurants offered fresh green smoothies at the drive-through? Unfortunately, most of them don’t – so if you’re short on time in the morning, blend one of these up at night, and pour into a cup with a lid, so you can drink it the next morning. Simply shake & go! To create a thick smoothie, mix using a regular blender or a Ninja. For a thinner drink, the fruits & veggies can be pressed through a juicer. You can also sub the ½ cup coconut water with regular water or almond milk. Adjust the amount for desired thickness. The waxy component of sebum that’s responsible for pore clogs is called Squalene Peroxide. Increasing Vitamin C intake prevents Squalene from oxidizing, thereby helping to prevent blackheads and acne breakouts. 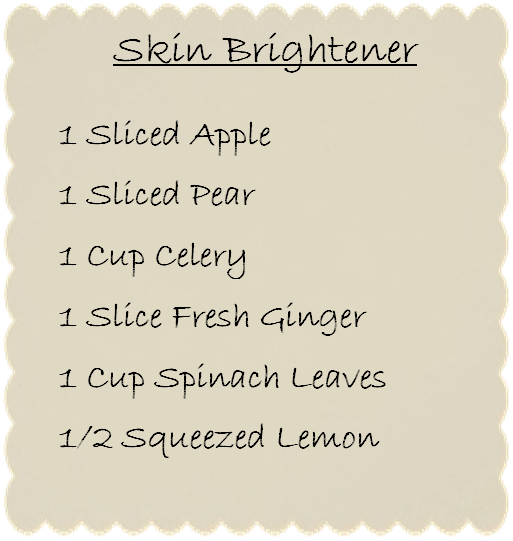 Apple, Pear, and Lemon provide skin-brightening Vitamin C, while Celery detoxifies the blood to release any toxins that may be lurking. Fresh Ginger amps up circulation – for a heightened natural glow. ​​A great way to start your day, every day! The green foods and apple cider vinegar in this recipe balance pH levels to fight inflammation. Cucumber decreases water retention, while banana adds potassium in case you’ve been having a little too much fun at the bar! When potassium levels dip (infamously caused by alcohol consumption), your skin can become dry – and begins producing excess oil to compensate. This is a fantastic smoothie to drink if you’ve over-done it with junk food and carbs. After making a slew of bad dietary choices, your body probably feels inflamed, puffy, and sluggish. Drink this to flush away retained water and neutralize pH level, bringing everything back into balance. This combination of fruits & veggies is packed with Vitamin C, Vitamin A, antioxidants and probiotics helps quell skin inflammation to reduce redness and puffiness surrounding breakouts. Drink several times weekly to discourage breakouts altogether! ​Top with pomegranate, chia or flax seeds for extra nutrition & added crunch! ​# 1) Be sure to use an oil absorbent primer, prior to foundation application! Mattify Cosmetics Transparent Powder for Oily Skin works as a skin-perfecting primer, to absorb oil and protect pores from foundation. It can be used before any type of makeup, to prevent foundation from settling into pores, and to absorb oil before unsightly shine begins to appear. # 3) Blush is a must to complete your look. Mattify's Long Lasting Matte Blush absorbs oil and provides a silky pop of color that lasts all day. Those with oily skin should always opt for matte blush, as shiny mica-based blush can make pores look larger, causing skin texture to appear uneven. If highlighter is used, stick to using it only on cupid's bow, tip of nose, under brows, and on inner corners of eyes - never on cheeks or over blush. *For added staying power on your matte makeup look, try Ben Nye Final Seal Setting Spray! 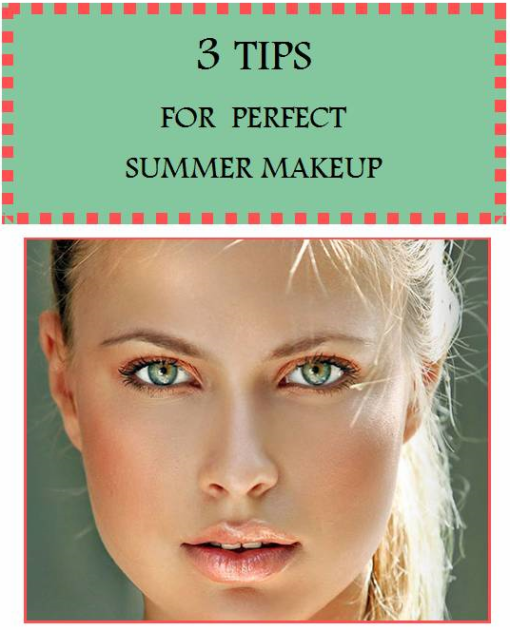 If you have large pores and oily skin, it can seem impossible to achieve a flawless look with makeup. Foundation often sinks into pores, accentuating and clogging them, while oily skin causes streaking, caking and fading. Why is Face Primer important to creating a flawless look? When foundation is applied without primer, it sinks deep into pores and fine lines- rather than skimming over the surface of the skin. This results in a blotchy, uneven complexion, with accentuated pores and likelihood for breakouts. When foundation enters pores, it stretches them out - causing them to look abnormally large. Primer essentially “fills in the gaps”, allowing foundation to look silky smooth. Oily Skin or Combination: Use a Powder Primer (try Mattify ULTRA Powder for Oily Skin). Women with oily skin normally have large pores and suffer from acne. Unlike gel primers, powder primer will not clog pores or cause breakouts. Rather, application of this powder primer actually protects skin from makeup. In addition it absorbs excess oil, to help foundation look smooth and last longer, without creasing or fading. As an added bonus, this specific ULTRA Powder doubles as your Blurring Powder for Step 3 below! 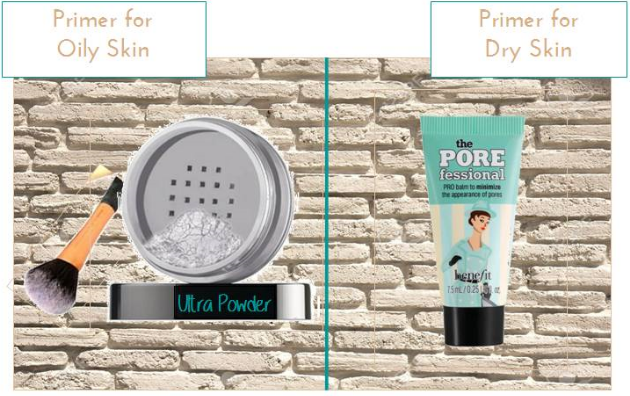 Dry Skin: Use a Silicone Gel Primer (try Benefit’s Porefessional Primer). Dry skin typically has small pores, but many fine lines. Silicone based primers settle into wrinkles, allowing foundation to skim over the top. Since foundation is essentially banned from seeping into fine lines, they become invisible and skin looks beautifully smooth. ​Beware! Remember, if you have large pores, it is safer to use powder primer. Silicone (dimethicone) gel based primers sink deep into pores, and are not easy to remove with routine cleansing. If you do use a gel primer, be sure to thoroughly exfoliate during cleansing, as this helps purge pores of sticky silicone. A peel-off charcoal mask is also helpful - (try Shills Black Peel Off Mask). This draws out impurities, before they lodge deeper into pores & cause breakouts. Selection of long lasting makeup allows foundation to survive the day without fading or rubbing off. This is especially important if you have oily skin, as that skin type tends to dissolve makeup even faster! Drugstore foundations normally last 4-6 hours, while higher end brands can last 6-10 hours. ​Dry skin: Dehydrated skin types fare better with moisturizing foundations, marketed as having a dewy / luminous / or moisturizing finish. Try Maybelline’s Fit Me Dewy & Smooth or Giorgio Armani Luminous Silk Foundation. If your skin is aging and needs a lift, try Estee Lauder Perfectionist. These foundations provide much needed moisture and contain luminizers to brighten up flaky dry skin types. What can blur powder do to help my complexion? This step allows foundation to look truly flawless! Blurring Powder acts as a soft-focus filter, taking any remaining fine lines or pores, and virtually erasing them. It also sets makeup for long wear! Oily Skin: The same Powder Primer you used in Step 1 (Mattify ULTRA Powder) also multi-tasks as an oil-absorbent blurring powder. Using a powder puff, pat the ULTRA Powder over your entire face. Blend in circular motions with a fluffy powder brush, to create a flawless complexion. This invisible powder sets makeup in place for long wear, and absorbs unsightly oil for hours. The product is completely matte and does not contain common irritants to oily skin such as mica, bismuth, or pearl powder. Dry Skin: (try Smashbox Halo Hydrating Powder). Finally, those with dry skin can create a dewy complexion! Using a fluffy powder brush, apply this moisturizing powder in light circular motions until blended. Since the product does have a luminizing sheen, it is best used on dry skin types (because it can make oily skin look oilier). 1) It really is all about that base! Apply a primer before foundation. Using primer before applying any type of makeup will allow the products to stay put on your skin. Dry skin types will do well with gel or cream primers such as Tarte's Base Tape Hydrating Primer. Oily skin types will require a powder primer that absorbs oil, like our Mattify Cosmetic's ULTRA Powder. Best of all, ULTRA Powder doubles as a setting powder to help foundation stay fresh for hours. 2) Jump right in! Select waterproof or water-resistant makeup. Look for those words on any type of makeup you purchase for summer. Even if you don't plan to go swimming, this is an important step. Humidity and sweat will cause makeup to smudge and smear. Oily skin makes the problem even worse! Water repellent makeup is much more resistant to any such elements. 3) Ready. Set. Go! Use a makeup setting spray. A few mists of setting spray will give any type of makeup (waterproof or not) extra staying power. Try Ben Nye Final Seal, now available on our Mattify website, or Model in a Bottle Setting Spray, to set everything from eyebrows to lipstick in place. This is a must-have item during hot summer months. ​Hats off to summer! Contouring Bronzer & Highlighter can help you achieve the perfect complexion. It minimizes a round face and a wide nose, so you can put your best face forward. Add a bit of mascara and copper eye shadow for a low-maintenance, glowing summer look! Don’t be afraid to highlight if you have oily skin! Mattify Cosmetics Strobing Highlighter contains natural ingredients to absorb oil, so you look glowy – not greasy! ​When skin is oily, the most important step in highlighting is to make sure you have a perfectly matte finish before applying highlighter. This ensures your oil-absorbent base will soak up any shine, leaving a subtle glow wherever your illuminator has been applied. “Get that Glow! Powder Highlighter for Oily Skin” ~ Mattify’s Powder Highlighter, has been featured on beauty blog www.mybestfriendshair.com. Click the link to discover 4 ways highlighting can uplift your look! ​You can also click here for another tutorial on how to apply highlighter to oily skin.